If you are not satisfied with a Staples branded product, you can return it at any time. 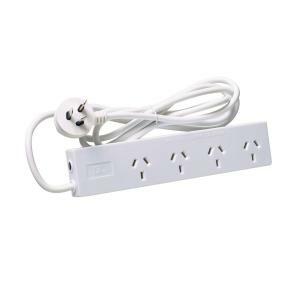 This Powerboard features 4 outlets with overload protection that will automatically cut off when overloaded to protect your electrical appliances. A push button is used to reset the powerboard should it cut off. The powerboard has a slimline plug and keyholes at the back of the unit enabling it to be attached to a wall. Powerboard unit measurements: 392gm/ 211.2cm (L) x 5cm (W) x 4.8cm (H). Colour: White Cord length is 1.8m. Also available in 0.9m. Certificate of Compliance AS/NZS 3760 If you are not satisfied with a Staples branded product, you can return it at any time.